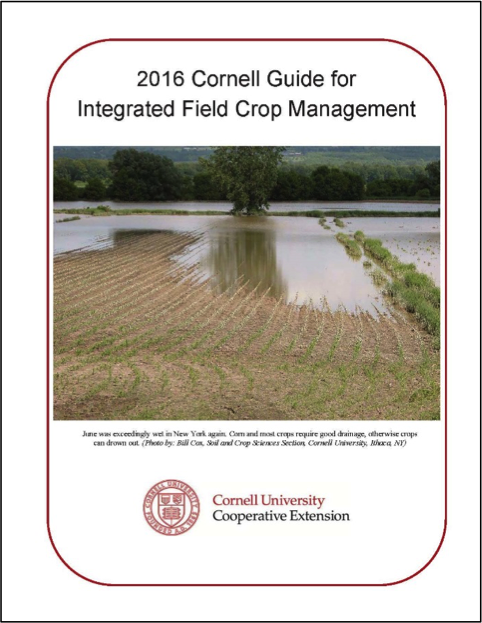 The 2016 edition of the Cornell Guide for Integrated Field Crop Management is now available. This annual publication provides up-to-date field crop production information for New York State. It is designed as a practical guide for field crop producers, crop consultants, ag chemical dealers, and others who advise field crop producers. A new section on spring malting barley, including field research trial data. Revised forage fertilization guidelines to include sulfur fertilizers. Updated corn, soybean, and wheat disease management tables. The Cornell Guidelines are available as a print copy, online-only access, or a package that combines print and online access. The print edition of the 2016 Field Crops Guide costs $26 plus shipping. Online-only access is $26. A combination of print and online access costs $36.50 plus shipping costs for the printed book. Cornell Guidelines can be obtained through your local Cornell Cooperative Extension office or from the Cornell Store at Cornell University. To order from the Cornell Store, call (800) 624-4080 or order online at http://store.cornell.edu/c-875-pmep-guidelines.aspx. 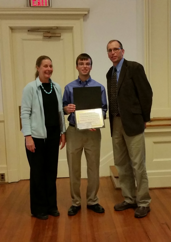 NYSABA Seed Committee Chair John Uveges (right) and Cornell’s Margaret Smith present Andrew Lefever with the 2015 NYSABA Seed Committee Outstanding Undergraduate Award. Cornell senior Andrew Lefever of Lancaster County, Pennsylvania is the 2015 winner of the New York State Agribusiness Association (NYSABA) Outstanding Undergraduate Award. The Award was presented December 3, 2015 at the Cornell Seed School held in Geneva, NY. The Award pays honor to one undergraduate student who has shown exceptional interest and dedication in study to the Agricultural Plant Industry particularly seed issues. Lefever is an Agricultural Sciences Major at Cornell University. “For many years, the NY Seed Association, now a part of NYSABA, and the American Seed Trade Association (ASTA), have awarded this scholarship to an outstanding student(s) in the field of plant science or plant breeding who plan to pursue further education or employment in agriculture,” said John Uveges, NYSABA Seed Committee Chair. “We were very excited to award this to Andrew this year because he has a real passion for plant breeding and seed issues. He has spent his summers getting to know different aspects of the industry. His freshman summer he prepared soil samples for Agri-Analysis, Inc, an agricultural testing lab. His sophomore summer, he interned for DuPont Pioneer in Lancaster working in corn research. This past summer, he was a research assistant for Cornell’s SPEAR program working on nutrient management projects. The scholarship is provided in partnership through NYSABA and the American Seed Trade Association (ASTA).